I am now booking Private Fine Art Workshop Parties for this fall and winter! 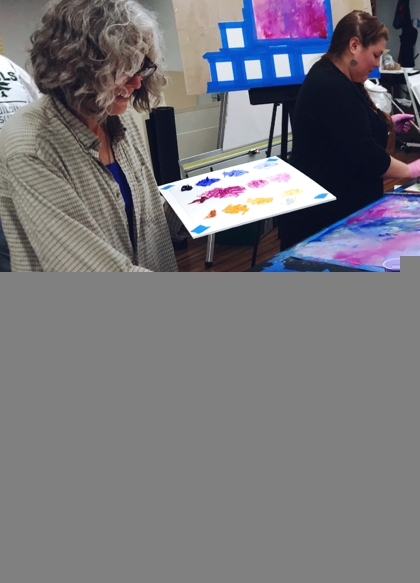 Get your friends together for a memorable night painting together for an Art Party Workshop! How is a Fine Art Party Workshop different from the "Paint Night" events you’ve seen? You will be provided with high quality, archival, fine art materials and I will be teaching you specific techniques, skills and concepts that will enhance your understanding of art, painting and art-making. You will each learn to make your own unique works of art, versus copying a prescribed, cookie-cutter image that you all copy. I arrive at your home with all of the materials and supplies needed. No matter the lesson you choose, and each person's level of experience (no art experience necessary!) in your private 2 hour workshop, we will support one another in tapping into our creativity, through specific exercises, experimentation while simply letting loose- and gaining new skills and making beautiful, unique works of art while we're at it! These workshops are all about learning real techniques and concepts by a trained, practicing professional artist and teacher (That would be me! ), while having fun with your friends or co-workers in the comfort of your home! As a gift for hosting an Art Party Workshop and serving your guests with what you might normally serve if you were having your friends over (imagine wine or refreshments and light apps), each party host will receive their materials for free. *Minimum of 4 students must be enrolled for event (not including host) two weeks in advance of event in order for workshop to take place. Last minute additions can often be accommodated if confirmed 72 hours prior to event. *When workshop is booked with 8 or more enrolled students, host receives their choice of any 10x10 Cameron Schmitz print on fine art paper, as a thank you gift, in addition to all students enrolled receiving a surprise freebie at the day of the event! In order to book your party and reserve your date and time, a $200 deposit is required, which secures a minimum of four spots for your Art Party Workshop. Once enrolled students have paid in full, deposit is immediately reimbursed to Party Host. To Book your Art Party Workshop, simply Email me at cameron@cameronschmitz.com with your preferred date and time and a list of your guests who you are inviting. It's suggested that you invite at least 8 participants to better guarantee a minimum of 4 students enrolled.